Flexibility – If availability is the key to mission work then flexibility must be key to a successful mission trip. Wednesday started great, great that is if you are from west Texas or another very dry climate. We had a deluge of rain. Apparently this is not the rainy season in Kolkata, but our team is nothing if not flexible. So, we visited the temple of the Hindu god Kali this morning instead of following through with our planned activity. Somewhere along the way we acquired a guide as we walked through the temple grounds, through the market area surrounding the temple, or as we entered the inner courts of the temple. Our guide was a junior priest, which we decided must be a priest in training. Our guide led us around to an area where animal sacrifices are done. They were preparing a young goat for sacrifice. After they cleaned the goat and hung a garland of flowers around his neck, he was sacrificed. It is hard to put into words the feeling of watching an animal be sacrificed – sacrificed to pay the price of a persons sin. It is interesting that all people inherently understand there must be a sacrifice for our sins. And even more interesting to me is that all peoples understand the necessity of a blood sacrifice for our sins. However, the people do not understand that sacrificing a young goat will not relieve them of their guilt. However, this change in plans allowed us the opportunity to capitalize on an appointment the Holy Spirit had arranged. We were fortunate to be able to share the gospel with this junior priest and explain how Christ gave His life once – for all. One of the folks who is stationed here gave the junior priest a coin after he had paid him for his guide duties. He explained that the coin was a free gift, all the junior priest had to do was accept the coin. He explained he did not do anything to earn the coin nor could he do anything to keep the coin. It was a free gift. We then asked if he knew or had heard of this man Jesus. This human man who was a blood sacrifice – like the goat. The junior Hindu priest had heard of Jesus. The scriptures are fulfilled here that many know His name, but not all have accepted Jesus as savior. We saw this young priest later and he went out of his way to explain to us that the coin was special. He would not spend it, but it keep as a reminder. We were Blessed to watch the Lord use this small coin as a reminder of Jesus sacrifice. It was quite amazing to all our team to see an animal sacrifice. We have knowledge of such things, but none of us had experienced. As we talked to this young man a crowd gathered. We moved on rather than creating a disturbance. 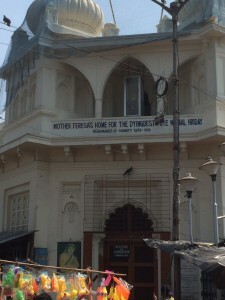 There were armed police watching and moving in toward our group, so we walked down to the Sisters of Charity home for the destitute and dying. 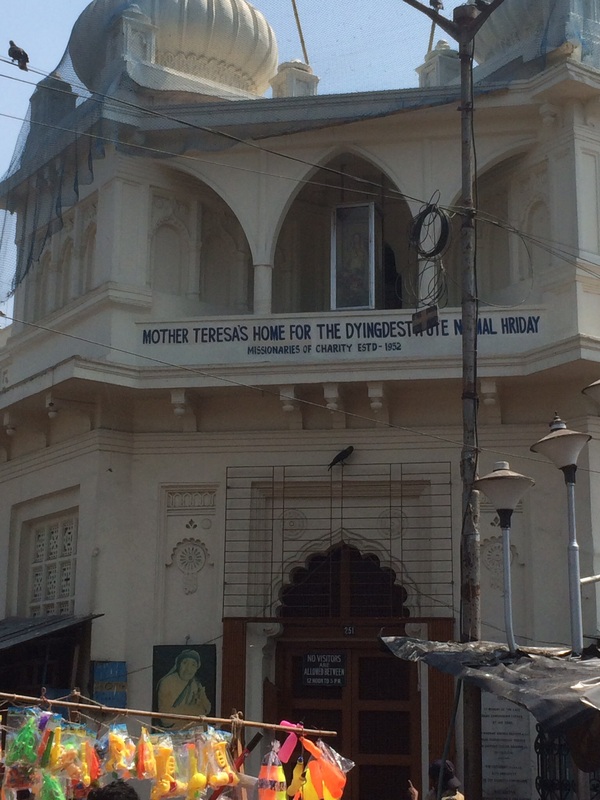 We all agreed that Mother Teresa was a bold witness to purchase land and daily demonstrate Gods love literally right outside the gates to a Hindu temple. We gathered there and prayed for all those who entered the temple to seek forgiveness through an animal sacrifice. We watched many people who appear to be successful and intelligent enter the temple grounds to worship. We assume it is the poor and unlearned who worship false idols. We are so Blessed to live where the name of Jesus is common and worship of Him is normal and customary. Thanks to a rain storm and this teams flexibility a divine appointment was made. A young man had the seeds of the gospel sown in his life and his 4 assistants who watched and listened from nearby also had seed sown. Some might think sowing seed with 5 men in a city of millions is akin to removing a pail of sand from the Sahara desert. We believe it is only our responsibility to be available and obedient. It is Gods responsibility to have the appointees in the right place at the right time. An out of season rainstorm may just be the ticket to have all in the right spot at the right time.